Hery Martial RAJAONARIMAMPIANINA RAKOTOARIMANANA, President of Madagascar, emphasizing that human needs must be at the centre of any country’s concerns, said the recent economic and social crisis had left Madagascar with a high poverty rate and afflicted by food insecurity. Despite those challenges, however, the country had no reason to remain poor, he said, describing himself as an optimist. Through the relentless work of its citizens, Madagascar was now reaching a new stage, and since 2016 had received increased investment, enabling it to develop key sectors, reduce poverty and act on behalf of the most vulnerable segments of society. Renewed investment and the strengthening of institutions had allowed for new infrastructure projects, the creation of jobs and the ability to participate more fully in the international community, he said, citing Madagascar’s membership of the Common Market for Eastern and Southern Africa (COMESA) and the International Organization of la Francophonie. He proposed new special economic zones to strengthen infrastructure, education and health, all pillars of sustainable national development, expressing Madagascar’s commitment to improving the quality of life for all its citizens. Turning to the Sustainable Development Goals, he said projects addressing Goal 4 were under way, and an ambitious education plan was being implemented to bring quality education to young people. There was also a focus on rebuilding a devastated health system, he said. The country was ready for a new health-care system, including an epidemiological survey system to evaluate potential crises in real time. The launch of a universal health-care plan was also under consideration, and a new national nutrition project was being implemented. 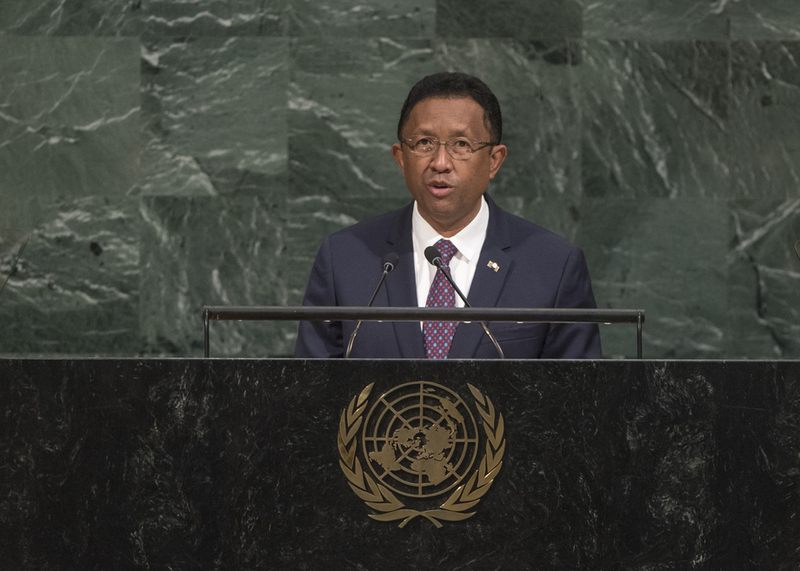 Calling attention to the risks of climate change for his country and the world, he said Madagascar was honouring the relevant agreements and had established protected marine areas. With the agricultural sector employing 75 per cent of the population, the country was mitigating risks by diversifying that sector. Investment in ports, highways and airports would “bring Madagascar back to the world economy,” he said, adding that focusing on the tourism sector would also attract investment. The economic model of tomorrow must be driven by low-carbon strategies that would guarantee better living conditions for future generations, he emphasized. Madagascar’s prospects were favourable, he said, noting that economic growth was projected to reach 5 per cent in 2018. The aim was to raise the country to the middle-income level by 2030. He affirmed that political reforms had been put in place to protect the integrity of democracy, and lasting economic growth was in sight. He concluded by stating that the General Assembly had the tools to accomplish the Secretary‑General’s goals, and expressed Madagascar’s support, and that of the Francophone community, for shared growth and sustainable development, vowing to stand strongly behind the values of solidarity.